The Farm Museum is a community hub, supporting youth, culture, health and community service groups wherever possible. 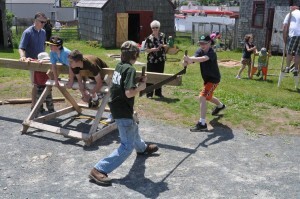 Along with our own programs, we play host to special events for the 4-HRM 4-H Club, the Cole Harbour Boys and Girls Club, and Girl Guides and Boy Scouts. We partner with cultural organizations to share music, storytelling and drama with the community. We provide work activities and supported work placements for a variety of community service organizations. We provide resources to arts initiatives, church groups, filmmakers, drama clubs and local business. We support interpretive programs for children, seniors, veterans and new immigrants.